Texas Attorney General Ken Paxton on Thursday informed the U.S. Supreme Court that if the 2012 Deferred Action for Childhood Arrivals program still exists in June, his office would consider filing suit to eliminate the program. The Obama-era program protects hundreds of thousands of undocumented immigrants from immediate deportation and allows them to legally work in the United States. But President Donald Trump in September 2017 announced his administration would end the program in March of this year. A federal district judge in California has placed that on temporary hold however, ruling that the administration could not abruptly shut down the program. Since then, U.S. Citizenship and Immigration Services began accepting renewal applications for two-year DACA permits, although new applications are not being considered. The Trump administration has since asked the U.S. Supreme Court to consider the case and overturn the judge's decision. It was in an amicus brief Paxton filed in support of the president Thursday that his office said it would consider future litigation. “Indeed, if the injunction is maintained through June 2018, amici States will be forced to consider filing a lawsuit challenging the original 2012 memorandum creating DACA,” the filing reads, referring to the 12 other states that signed on to Paxton’s brief. Paxton’s action on Thursday follows his June 2017 memo to the Trump administration where the attorney general threatened legal action if the administration didn’t announce the end of the program by September of that year. Texas had the second-highest number of DACA beneficiaries, about 124,000, when the Trump administration announced the program would be phased out. 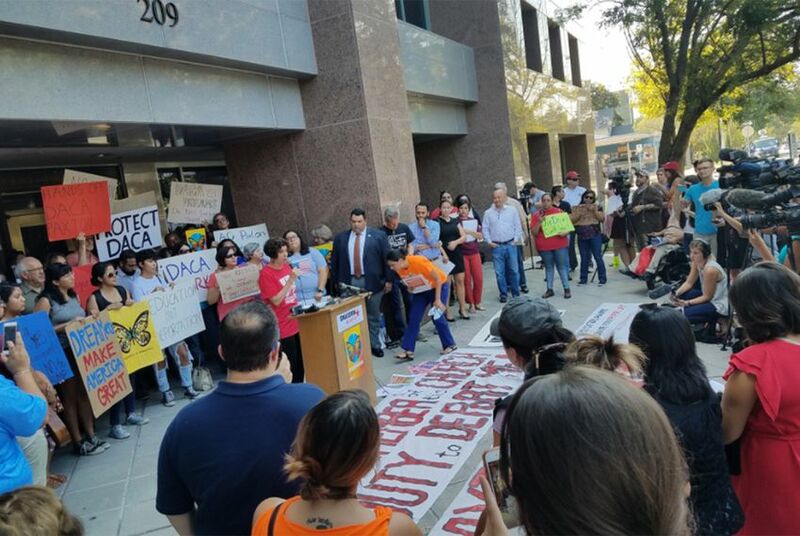 Texas also led the charge in 2014 to stop a second deferred action initiative, Deferred Action for Parents of Americans and Lawful Permanent Residents, or DAPA, which would have greatly expanded the eligible pool of undocumented immigrants who were eligible for the temporary protection. That challenge was successful, and the program was never implemented. Paxton also made note of that litigation in the brief filed Thursday and said the arguments made then are still valid as to why DACA is unlawful. Though he announced an end the program, Trump has also stated that his administration was phasing it out over six months to allow Congress to act. Just how to do that, however, has been a point of contention in Washington — leading to the brief government shutdown of the federal government that began Jan. 20. Late Thursday however, the White House reportedly sent to members of Congress a plan that would protect the young undocumented immigrants and bolster border security. The plan, according to Politico, includes $25 billion for additional border security measures, including a barrier on the southern border, and rolling back current immigration policies.